When interviewing public figures like politicians, or in this case, the Sheriff, I expect to have to slog through barricades of P.C talking points in order to get a glimpse of the real person. 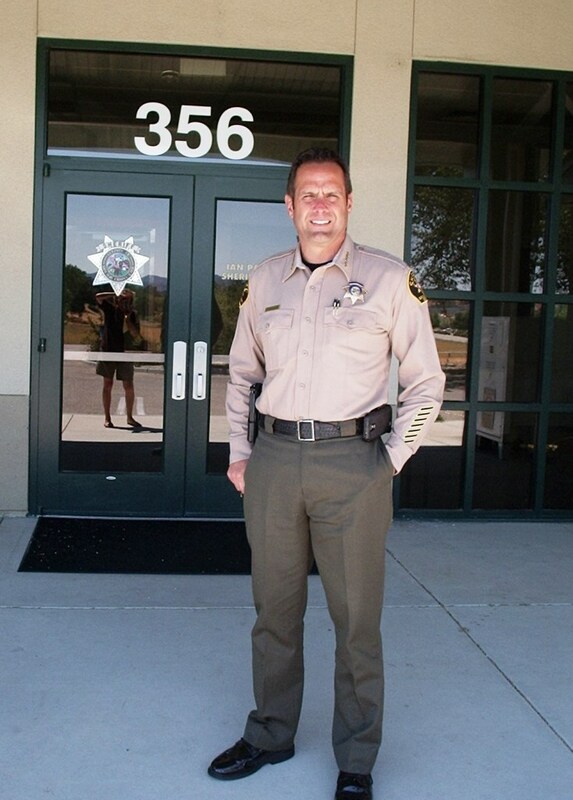 Not so with Sheriff Ian Parkinson of San Luis Obispo County, California. At 356 Main Street in Templeton, CA, the Northern headquarters in the domain of the Sheriff of S.L.O. County, I was met in the front hall by the man himself and Public Information Officer, Tony Cipolla. Ushered into a large meeting room lined with Formica wood grained tables and plastic chairs, I pulled a chair around to face the Sheriff. The Sheriff gave me his full attention while P.R. man, Cipolla, faded mutely into the background on the other side of the table, signalling that his man could hold his own..
At a buff six foot three, Ian Parkinson has the quiet elegance of a big jungle cat. He’s comfortable with himself and has little desire to blow his own horn. I had to coax him to admit that he has a black belt in Kempo – a deadly fighting system of defensive and offensive methods that originated circa 527 A.D. in a Shaolin Temple in central China. The stillness that surrounds him is born from decades as a dedicated martial artist who knows he can erupt into controlled violence in a nano second. Trust me bad guys; you do not want to mess with this man! “Kempo is the power of adaptability and yielding; the harmony of all things working together,” a quote attributed to Ying Kuchan, a Shaolin monk. Adapting and promoting harmony in any given situation seems to be a Parkinson trademark. He has no jurisdictional issues with any Federal, City or State agencies, and gets along well with all of them. According to one associate, Sheriff Parkinson is easy to work with, doesn’t have a temper but he can be tough on discipline. One of the first things he did when coming into office was establish an internal affairs unit. “We hold our people accountable,” he states. In law enforcement for more than 30 years, he became Sheriff in 2011 and manages over 250 Deputies and 150 support personnel. While he admits that part of him misses the action of going out and catching bad guys, he says he really likes his current position. It’s protocol to call the Sheriff to come out at night when something serious is happening, like a murder, a robbery in process, or a hostage situation. He laughs and admits that his wife, Ami, is used to being woken up a few times a week. When asked to describe her, he proudly says she’s gorgeous. S.L.O County is a big territory to keep safe. Sheriff’s Deputies patrol 100 miles of coastline and 3200 square miles of territory, excluding approximately 100 square miles policed by the cities. Sheriff Parkinson says that his biggest concern is the growing gang problem with the northern gangs from Monterey and the southern Los Angeles gangs beginning to converge on S.L.O. County. His Gang Task Force is kept busy with gang members shooting each other, shooting at cars, drug dealing and their inclination for theft in general. He points out that Google Earth has made it easier for rural theft to occur and recommends that citizens remember to lock their doors and not leave car keys in the ignition. Big dogs are good for home security, he says, but if you’re going to have guns, please get trained. Local gun shops can recommend various instructors for firearms training. At the end of the day, Sheriff Ian Parkinson is a nice guy who doesn’t have to pretend to be tough – he is. San Luis County is fortunate to have him keeping his well-trained Deputies between citizens and the bad guys. Parkinson was elected in 2011 and re-elected twice, lastly in June, 2018. First published in The Paso Robles Daily News.